Photos of the beautiful book covers illustrated by Allan Kass from 1969 through 1998. Most of these are Regency Romances, but he also illustrated some young adult, westerns, mystery, and gothic books. Enjoy! 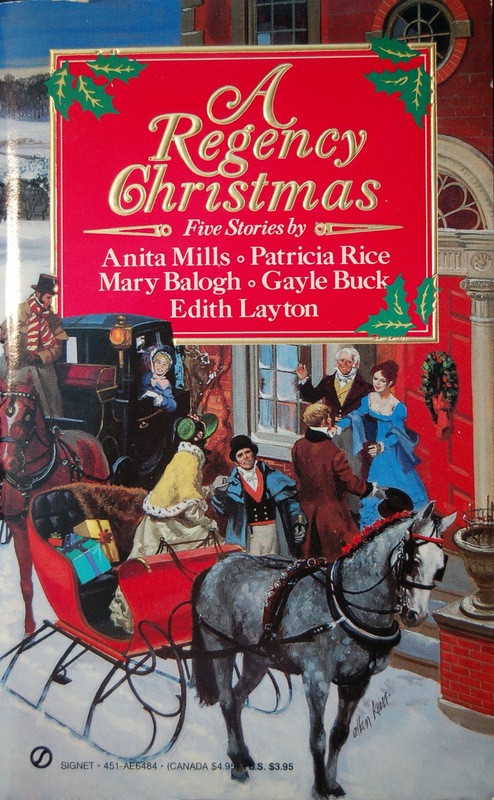 A Regency Christmas 1 was published in November 1989 and was so successful that Signet published a Christmas short story series for many years after. While Allan Kass didn't illustrate all of them, he did enough that you can see and enjoy. This was the first book and has stories by famous authors Anita Mills, Patricia Rice, Mary Balogh, Gayle Buck, and Edith Layton. They are still great reads. Allan Kass creates a Christmas card image here with guests arriving for the holiday season! We see them bringing gifts in the horse drawn sleigh and happy residents greeting relatives and guests to their home. It's a magical picture of the season. This is the last book I have that I know for sure Allan Kass illustrated and a great one with which to end the series. He told me before his death that he illustrated somewhere between 800-1000 book covers and this book is # 785. Before illustrating books, Kass lived in Detroit illustrating auto company magazine ads. If you find a book that I don't have listed in the blog, please contact me with the information. I hope that you've enjoyed reading and seeing the work of this talented artist. 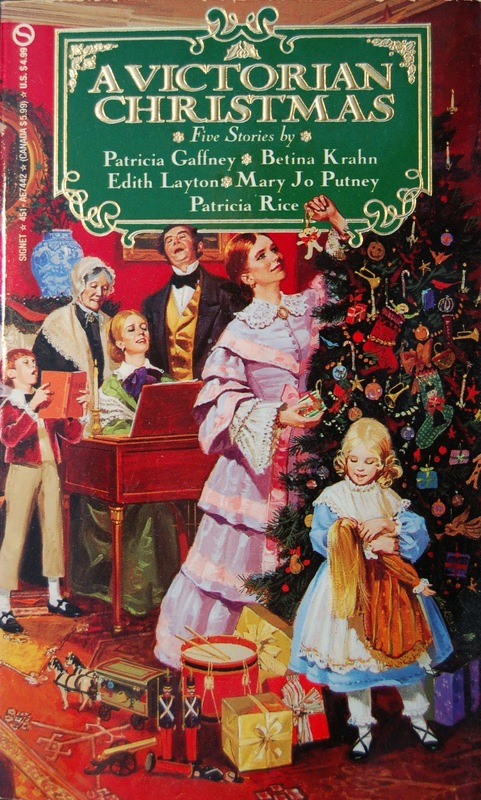 A Victorian Christmas was published in November 1992 by Signet and contains Victorian Christmas stories by authors Patricia Gaffney, Betina Krahn, Edith Layton, Mary Jo Putney, and Patricia Rice. This was the only year that this was published, so it may not have been as popular as its regency counterpart. Allan Kass illustrates a family celebrating Christmas day as they sing around the piano and play with gifts just opened. I like all of the detail Kass puts into these festive covers with a highly decorated tree, the expressions of the children, and the detail of the outfits worn. I like that it evokes memories of past and future holidays. 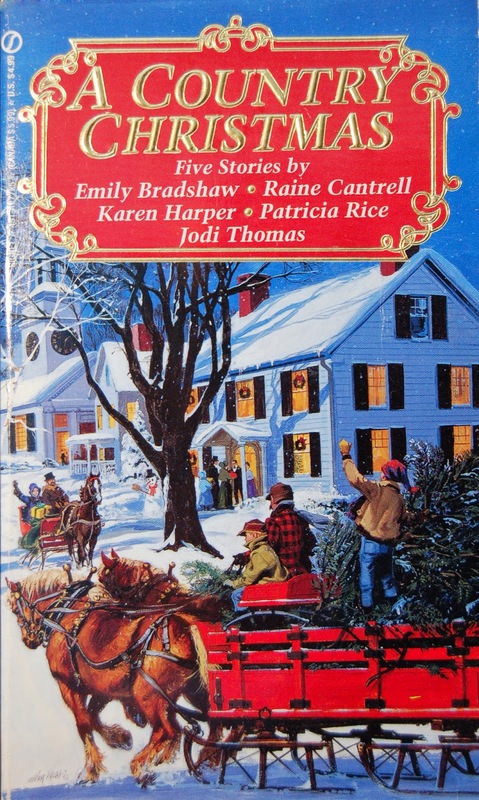 A Country Christmas was published by Signet in November 1993 and is an anthology of short stories set all over America. The authors are Emily Bradshaw, Raine Cantrell, Karen Harper, Patricia Rice, and Jodi Thomas. Allan Kass illustrates a village scene with a large snow covered farmhouse and church where people are gathering to celebrate the season. I like that the nearest sled has the tree which is about to be decorated. It's a joyous scene and one that evokes all of the memories of the Christmas holiday. 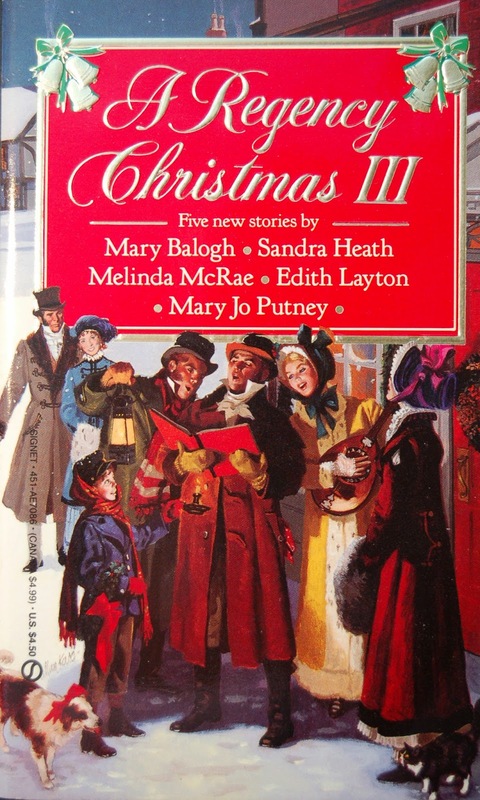 November 1991 Signet's publication date for A Regency Christmas 3 and it's a collection of holiday short stories by Mary Balogh, Sandra Heath, Melinda McRae, Edith Layton, and Mary Jo Putney. If you haven't read any of these, try and find since they are some of the best holiday stories around! Allan Kass illustrates this cover with a group of Christmas carolers which embodies the joys of the season as they sing and make merry. I like their colorful costumes. The young child and animals make it a festive occasion for all. 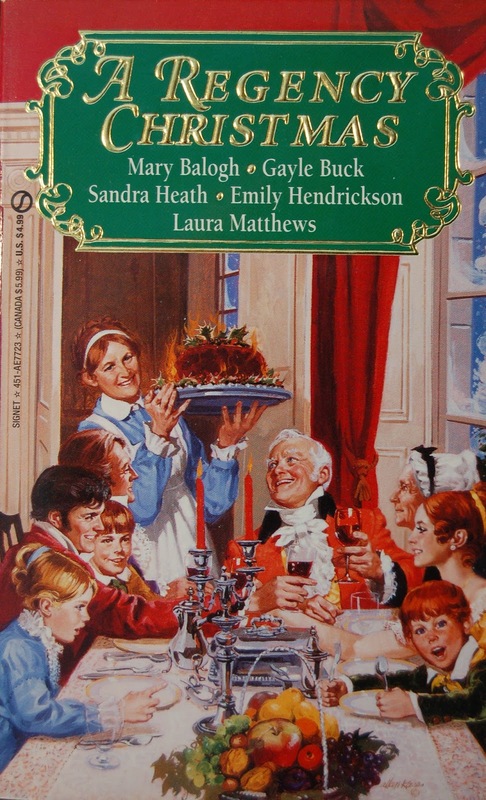 A Regency Christmas 5 was published by Signet in November 1993 and has holiday stories by famous regency authors Mary Balogh, Gayle Buck, Sandra Heath, Emily Hendrickson, and Laura Matthews. Allan Kass illustrates a family at the dinner table for a Christmas feast for this cover. We see the turkey being brought in to an animated group of all ages sitting down together. It's a happy and joyous event that comes across to the reader of the joys of the season. 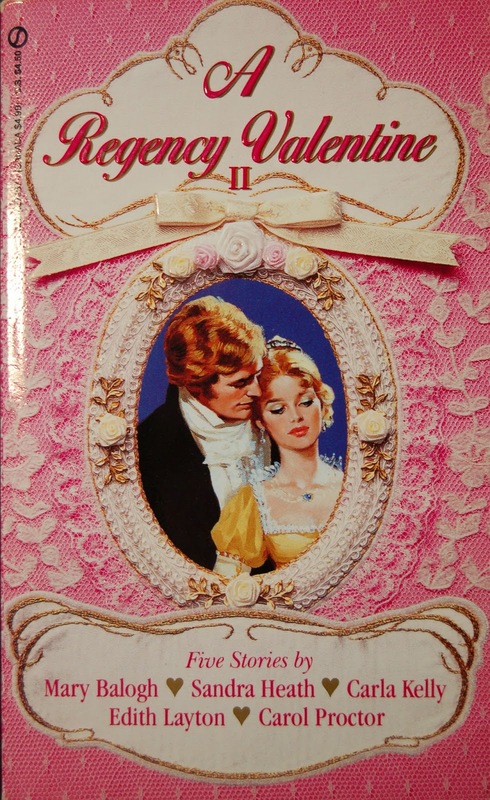 A Regency Valentine 2 was published by Signet in January 1992. It has stories by authors Mary Balogh, Sandra Heath, Carla Kelly, Edith Layton, and Carol Proctor. Allan Kass gives us another illustration of a couple in love, this time set in an oval frame. Our couple is dressed for a ball and look very elegant. The pink and lacy theme of the cover reference the holiday. Signet published two more editions of Valentine stories but Kass didn't illustrate them. 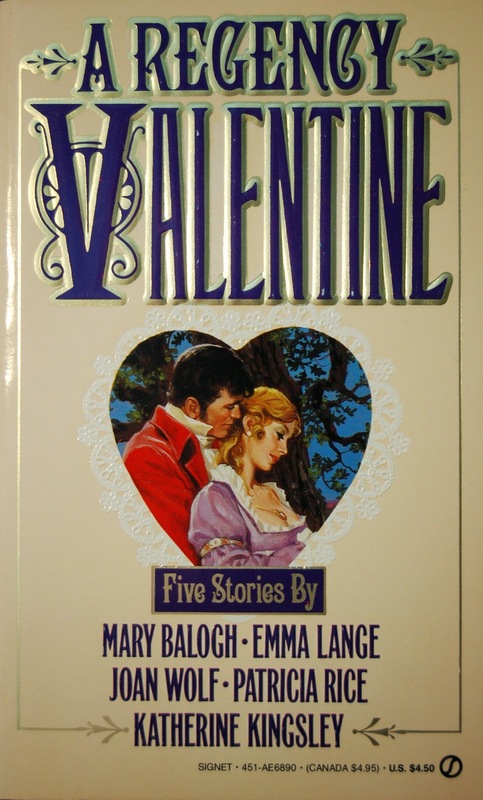 A Regency Valentine was published by Signet in February 1991 and is a short story anthology with stories by authors Mary Balogh, Emma Lange, Joan Wolf, Patricia Rice, and Katherine Kingsley. All of the stories revolve around Valentine's Day and love. Allan Kass gives us a valentine of a cover with our couple in love. We don't see much more except that they are dressed in regency garb and standing outside and obviously in love. It's a neat idea to place the painting inside a lacy heart but I like the full cover illustrations better.